Is that a muller on the window sill? He shows up with this hat in other self portraits, is it sheep skin hat with the wool on the inside? 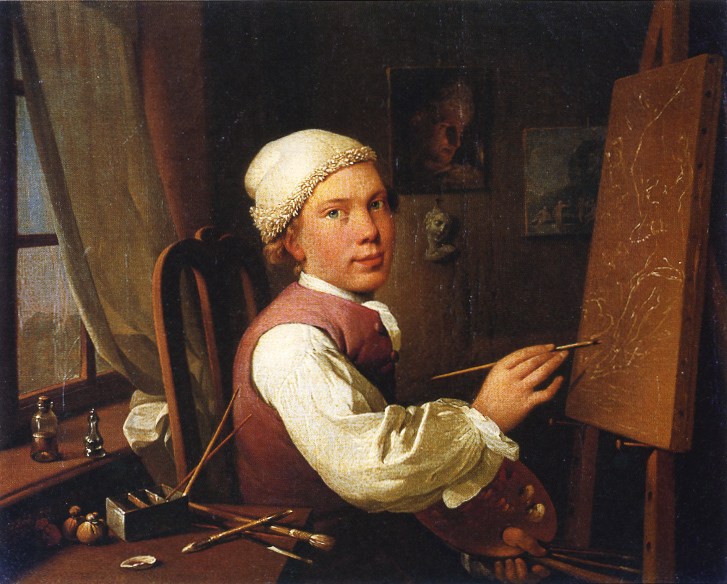 Also, the texture of the cap in the other self-portrait by Jens Juel suggests that it is not sheepskin, but a knitted and “thrummed” cap worn with the thrumming inside. Here’s a blog post about an 18th century thrummed cap. I don’t think it is a muller, rather some sort of caster. A muller wouldn’t be made of metal so as to not add any minerals to the pigment. On the window sill there is a bottle, possibly of oil that he is sun thickening. The other object isn’t stone or glass so it isn’t a muller. On the table, there are paint filled bladders, a shell (interesting possible use since shells weren’t really used with oil paints). The tin box likely holds brushes he’s been using in turpentine or oil. There is also a chalk holder.